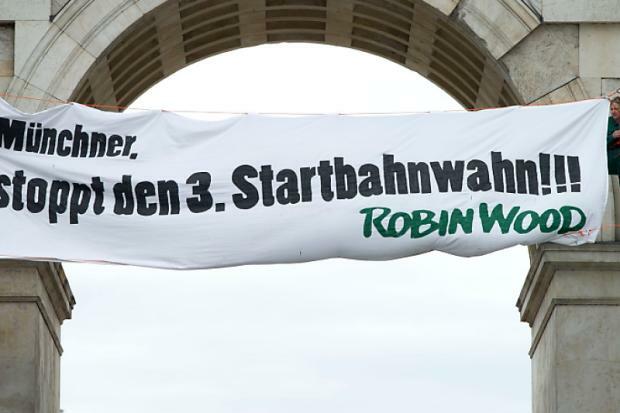 Campaigners from Robin Wood, and Plane Stupid Germany have carried out a spectacular action in the centre of Munich, protested against the planned third runway at the airport. They fixed banners reading “Stop the third runway madness!” on the Victory Tower (Siegestor). They also had banners saying “No on 17.6. because they are asking the electorate to vote against the construction of the runway in Erdinger Moos in the referendum on 17th June. They are also demanding a statement from Mayor Christian UDE (SPD), on how he is able to justify supporting the expansion of the airport, as well as the Festival for the environment and sustainable mobility ,as patron of Streetlife. Munich (DAPD-bay). A week before the referendum opponents of the third runway at Munich Airport have called for a vote against the expansion plans. On Friday, several activists climbed on the winning goal and had placards with slogans such as “Stop the 3rd runway madness” down, as the environmental organization Robin Wood announced. 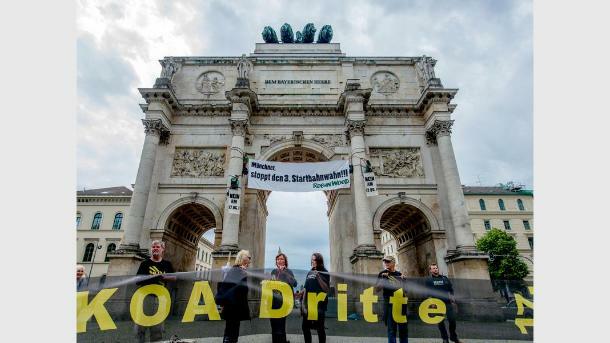 With the action, the runway opponents mobilize over a million citizens eligible to vote, on 17 To vote in June against the controversial project.The event was supported by the network Plane Stupid Germany. München (dapd-bay). Eine Woche vor dem Bürgerentscheid haben Gegner der dritten Startbahn am Münchner Flughafen zu einem Votum gegen die Ausbaupläne aufgerufen. Am Freitag kletterten mehrere Aktivisten auf das Siegestor und ließen Plakate mit Slogans wie “Stoppt den 3. Startbahnwahn” herunter, wie die Umweltorganisation Robin Wood mitteilte. Mit der Aktion wollen die Startbahngegner die über eine Million wahlberechtigten Bürger mobilisieren, am 17. Juni gegen das umstrittene Projekt zu stimmen. Unterstützt wurde die Aktion von dem Netzwerk Plane Stupid Germany. Posted: Saturday, June 9th, 2012. Filed in News about Airports, Publicity & Politics, Recent News.